The Keighley & Worth Valley Railway is having their 50th Anniversary Gala in June/July 2018. They already have two locomotives booked now GWR 7714 Pannier Tank is joining them. 7714 is a GWR Collett 5700 class 0-6-0PT ‘pannier tank’, one of two examples on the Severn Valley Railway (the other being 5764). The 5700 class was the most numerous class of engine designed and built by the Great Western Railway; more than 860 were built between 1929 and 1950. Pannier tanks could be found at work all over the former GWR system and although designed primarily for shunting duties, they were regularly used on local freight and passenger workings. 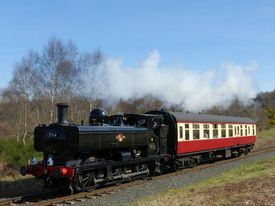 British Railways Western Region 'BR(W)' rated the class as 4F, although elsewhere the class was rated 3F.